Hi, I`m Bill, hanging with my bonded buddy Mardell. We came from the shelter in Santa Cruz and Mickaboo took us in. I like my new foster home - our new foster parent gives us yummy Nutri-An cakes. 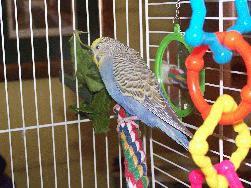 I also like to eat my Roudybush pellets and I`ll tolerate the greens I get. When I`m uncovered in the morning, I like to tweet my good morning to you...VERY LOUDLY... Mardell and I are chatty and would love to entertain you in YOUR forever home.